Prof Michael Smart’s research interests are in: Hypersonic aerodynamics, scramjets, compressible fluid flow. Professor Smart, who graduated with a Bachelor of Engineering (Hons) at UQ in 1985 and Master of Engineering Science at UQ in 1987, was awarded a PhD at the Polytechnic University, Brooklyn, New York, in 1995. He was appointed an Associate Professor in the Centre for Hypersonics in 2005 after spending 10 years as a research scientist at NASA's Langley Research Center in Virginia. He is the chief investigator on the five-year National and International Research Alliances partnership collaboration between UQ, the Queensland Government, Boeing, USAF and DSTO to conduct scramjet-related flight tests as part of the HiFIRE program. 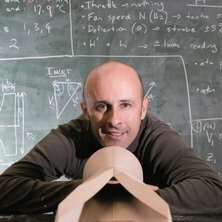 As head of UQ's HyShot Group, Professor Smart leads scramjet related research within the Centre for Hypersonics, with particular emphasis on flight applications. He received the 2012 International Congress for Aeronatucs (ICAS) Von Karman Award for International Co-operation in Aeronautics. Trajectory Optimisation and control of a fly-back rocket booster. Zander, Fabian, Smart, Michael K., Drennan, John, Morgan, Richard G. and Wheatley, Brad (2013) Extreme materials in hypersonics. Materials Australia, 46 1: 41-45. How much compression should a scramjet inlet Do? Smart, M.K. (2007) Scramjets. Aeronautical Journal, 111 1124: 605-619. Kalkhoran, IM, Smart, MK and Wang, FY (1998) Supersonic vortex breakdown during vortex/cylinder interaction. Journal of Fluid Mechanics, 369 351-380. Smart, MK and Stalker, RJ (1991) The Glancing Interaction of a Prandtl-Meyer Expansion Fan with a Supersonic Wake. Aeronautical Journal, 95 942: 39-47. Smart, Michael K. and Stalker, Raymond J. (1991) The glancing interaction of a Prandtl-Meyer expansion fan with a supersonic wake. Aeronautical Journal, 95 942: 39-47. Landsberg, Will O., Gibbons, Nicholas N., Wheatley, Vincent, Smart, Michael K. and Veeraragavan, Ananthanarayanan (2017). Flow field manipulation via fuel injectors in scramjets. In: 21st AIAA International Space Planes and Hypersonics Technologies Conference, Hypersonics 2017. 21st AIAA International Space Planes and Hypersonics Technologies Conference, Hypersonics 2017, Xiamen, China, (). 6 - 9 March 2017. Chai, Joseph, Smart, Michael K., Forbes-Spyratos, Sholto and Kearney, Michael (2017). Fly Back Booster Design for Mach 5 Scramjet Launch. In: 68th International Astronautical Congress 2017 Proceedings. 68th International Astronautical Congress, Adelaide, Australia, (1-11). 25-29 September 2017. Chai, Joseph, Smart, Michael, Forbes-Spyratos, Sholto and Kearney, Michael (2017). Fly back booster design for Mach 5 scramjet launch. In: 68th International Astronautical Congress, IAC 2017: Unlocking Imagination, Fostering Innovation and Strengthening Security. 68th International Astronautical Congress: Unlocking Imagination, Fostering Innovation and Strengthening Security, IAC 2017, Adelaide, SA, Australia, (10140-10150). 25-29 September 2017. Landsberg, Will O., Wheatley, Vincent, Smart, Michael and Veeraragavan, Ananthanarayanan (2017). Performance of high Mach number scramjets - Tunnel vs flight. In: 68th International Astronautical Congress, IAC 2017: Unlocking Imagination, Fostering Innovation and Strengthening Security. 68th International Astronautical Congress: Unlocking Imagination, Fostering Innovation and Strengthening Security, IAC 2017, Adelaide, SA, Australia, (9156-9164). 25-29 September 2017. Landsberg, Will O., Wheatley, Vincent, Smart, Michael K and Veeraragavan, Ananthanarayanan (2017). Reducing combustor length within a mach 12 shape-transitioning scramjet. In: 11th Asia-Pacific Conference on Combustion, ASPACC 2017. 11th Asia-Pacific Conference on Combustion, ASPACC 2017, Sydney, Australia, (). 10-14 December 2017. Denman, Z. J., Wheatley, V., Smart, M. K. and Veeraragavan, A . (2016). Fuel injection and mixing in a Mach 8 hydrocarbon-fuelled scramjet. In: 20th Australasian Fluid Mechanics Conference. 20th Australasian Fluid Mechanics Conference, Perth, Australia, (). 5 – 8 December 2016. Alesi, Hans, Paull, Allan, Smart, Michael and Bowcutt, Kevin G. (2015). A concept for the HiFIRE 8 flight test. In: Proceedings of 22nd ESA symposium on European rocket and balloon programmes and related research. 22nd ESA Symposium on European Rocket and Balloon Programmes and Related Research, Tromso, Norway, (401-408). 7-12 June 2015. Landsberg, W. O., Barth, J. E., Veeraragavan, A., Wheatley, V. and Smart, M. K. (2014). Tailored fuel injection within a Mach 12 shape transitioning scramjet. In: Harun Chowdhury and Firoz Alam, Proceedings of the 19th Australasian Fluid Mechanics Conference. 19th Australasian Fluid Mechanics Conference, Melbourne, VIC, Australia, (288.1-288.4). 8-11 December 2014. Glass, David E., Capriotti, Diego P., Reimer, Thomas, Kutemeyer, Marius and Smart, Michael (2014). Testing of DLR C/C-SiC and C/C for HIFiRE 8 scramjet combustor. In: 19th AIAA International Space Planes and Hypersonic Systems and Technologies Conference. 19th AIAA International Space Planes and Hypersonic Systems and Technologies Conference 2014, Atlanta, GA, United States, (). 16-20 June 2014. Petty, David J., Wheatley, V. and Smart, M. K. (2012). A parametric study of oxygen enriched scramjet combustion. In: Wayne Short and Iver Cairns, Proceedings of the 11th Australian Space Science Conference. 11th Australian Space Science Conference, Canberra, Australia, (327-338). 26 - 29 September 2011. Aagon, A., Abeynayake, D. and Smart, M. (2012). Applicability of viscous and inviscid flow solvers to the hypersonic REST inlet. In: P. A. Brandner and B. W. Pearce, Proceedings of the 18th Australasian Fluid Mechanics Conference. 18th Australasian Fluid Mechanics Conference, Launceston, Australia, (). 3-7 December 2012. Razzaqi, Sarah A., Bode, Christoph, Eggers, Thino and Smart, Michael K. (2012). Development of functional relationships for air-data estimation using numerical simulations. In: P. A. Brandner and B. W. Pearce, Proceedings of the 18th Australasian Fluid Mechanics Conference. 18th Australasian Fluid Mechanics Conference, Launceston, TAS, Australia, (). 3-7 December 2012. Barth, James E., Wheatley, Vincent and Smart, Michael K. (2012). Effects of ethylene combustion in a hypersonic turbulent boundary layer. In: Wayne Short and Iver Cairns, Proceedings of the 11th Australian Space Science Conference. 11th Australian Space Science Conference, Canberra, Australia, (313-325). 26 - 29 September 2011. Bowcutt, Kevin, Paull, Alan, Dolvin, Douglas and Smart, Michael (2012). HIFiRE: an international collaboration to advance the science and technology of hypersonic flight. In: ICAS 2012 CD-ROM Proceedings. 28th International Congress of the Aeronautical Sciences (ICAS 2012), Brisbane, QLD, Australia, (65-76). 23-28 September 2012. Barth, James E., Wheatley, Vincent and Smart, Michael K. (2012). Streamwise porthole fuel injection for boundary-layer combustion inside a scramjet engine. In: I. Grant, ICAS 2012 CD-ROM Proceedings. 28th International Congress of the Aeronautical Sciences (ICAS 2012), Brisbane, Australia, (2934-2941). 23 - 28 September 2012. Razzaqi, Sarah A., Jazra, Thomas, Smart, Michael K. and Ferguson, Thomas (2011). Optimisation of scramjet-assisted access-to-space vehicles using oxygen enrichment. In: Wayne Short and Iver Cairns, Proceedings of the 10th Australian Space Science Conference. 10th Australian Space Science Conference (ASSC), Brisbane, Australia, (67-78). 27-30 September 2010. Jazra, Thomas and Smart, Michael (2010). Comparison of two optimisation approaches for the design of hypersonic airbreathing accelerators. In: Wayne Short and Iver Cairns, Proceedings of the 9th Australian Space Science Conference. 9th Australian Space Science Conference, Sydney, Australia, (163-174). 28-30 September, 2009. Gollan, Rowan J. and Smart, Michael K. (2010). Design of modular shape-transitioning inlets for a conical hypersonic vehicle. In: Proceedings of the 48th AIAA Aerospace Sciences Meeting Including the New Horizons Forum and Aerospace Exposition. 48th AIAA Aerospace Sciences Meeting Including the New Horizons Forum and Aerospace Exposition, Orlando, Florida, United States, (1-15). 4-7 January 2010. Buttsworth, David R. and Smart, Michael K. (2010). Development of a Ludweig tube with free piston compression heating for scramjet inlet starting experiments. In: 48th AIAA Aerospace Sciences Meeting Including the New Horizons Forum and Aerospace Exposition 2010. 48th AIAA Aerospace Sciences Meeting Including the New Horizons Forum and Aerospace Exposition, Orlando, Florida, United States, (2010-0588.1-2010-0588.6). 4-7 January 2010. Petty, D., Smart, M. K., Wheatley, V. and Razzaqi, S. A. (2010). Simulation of hypervelocity scramjet combustion with oxygen enrichment. In: Wayne Short and Iver Cairns, 10th Australian Space Sciences Conference, Brisbane, Australia, (). 27-30 September 2010. Jazra, Thomas and Smart, Michael (2009). Development of an aerodynamics code for the optimisation of hypersonic vehicles. In: 47th AIAA Aerospace Sciences Meeting including The New Horizons Forum and Aerospace Exposition. 47th AIAA Aerospace Sciences Meeting Including The New Horizons Forum and Aerospace Exposition, Orlando, Florida, (1-14). 5 - 8 January 2009. Andrew N. Ridings and Michael K. Smart (2009). Experimental studies of divergent supersonic circular combustors. In: 47th AIAA Aerospace Sciences Meeting including the New Horizons Forum and Aerospace Exposition. 47th AIAA Aerospace Sciences Meeting including the New Horizons Forum and Aerospace Exposition, Orlando, FL, USA, (2009-1425 - 1-2009-1425 - 14). 5-8 January 2009. Smart, M. K. and Suraweera, M. V. (2009). HIFiRE 7: Development of a 3-D scramjet for flight testing. In: Hypersonics 2009: 16th AIAA/DLR/DGLR International Space Planes and Hypersonic Systems and Technologies Conference (2009). Hypersonics 2009: 16th AIAA/DLR/DGLR International Space Planes and Hypersonic Systems and Technologies Conference, Bremen, Germany, (). 19-22 October 2009. Smart, M. K. and Moule, Y. (2009). Performance analysis of a Mach 12 REST scramjet at off-design conditions. In: Hypersonics 2009: 16th AIAA/DLR/DGLR International Space Planes and Hypersonic Systems and Technologies Conference (2009). Hypersonics 2009: 16th AIAA/DLR/DGLR International Space Planes and Hypersonic Systems and Technologies Conference, Bremen, Germany, (). 19-22 October 2009. Thomas Jazra and Michael Smart (2009). Preliminary design of an integrated scramjet-powered accelerator. In: 16th AIAA/DLR/DGLR International Space Planes and Hypersonic Systems and Technologies Online Conference Proceedings. 16th AIAA/DLR/DGLR International Space Planes and Hypersonic Systems and Technologies Conference, Bremen, Germany, (AIAA 2009-7418-1-AIAA 2009-7418-13). 19-22 October 2009. Turner, James C. and Smart, Michael K. (2008). Application of radical farming to a 3-D scramjet at Mach 8. In: 2008 AIAA Meeting Papers on Disc. 46th AIAA Aerospace Sciences Meeting and Exhibit, Reno, U.S.A, (). 7-10 January, 2008. Smart, Michael (2008). Scramjets. In: Advances on Propulsion Technology for High-Speed Aircraft. AVT-150 RTO AVT/VKI Lecture Series held at the von Karman Institute, Brussels, Belgium, (9-1-9-38). 12-15 March, 2008. Suraweera, Milinda and Smart, Michael (2008). Shock tunnel experiments with a Mach 12 REST scramjet at off-design conditions. In: 46th AIAA Aerospace Sciences Meeting and Exhibit 2008. 46th AIAA Aerospace Sciences Meeting and Exhibit, Reno, USA, (). 7-10 January, 2008. Razzaqi, S. A., Smart, M. K. and Weidner, N. (2007). Analysis of Scramjet Flight Trajectories with Oxygen Enrichment. In: Peter Jacobs, Tim McIntyre, Matthew Cleary, David Buttsworth, David Mee, Rose Clements, Richard Morgan and Charles Lemckert, 16th Australasian Fluid Mechanics Conference (AFMC). 16th Australasian Fluid Mechanics Conference (AFMC), Gold Coast, Queensland, Australia, (303-307). 2-7 December 2007. Morgan, Richard, Paull, Allan, Smart, Michael and Stalker, Ray (2007). Hypersonics Research in Australia. In: Advances on Propulsion Technology for High-Speed Aircraft: Papers presented during the AVT-150 RTO AVT/VKI Lecture Series. AVT-150 RTO AVT/VKI Lecture Series: Advances on Propulsion Technology for High-Speed Aircraft, Von Karmen Institute for Fluid Mechanics, Rhode St. Genese, Belgium, (11-1-11-30). 12-15 March 2007. Smart, Michael K. and Ruf, Edward G. (2006). Free-jet Testing of a REST Scramjet at Off-Design Conditions. In: Proceedings of the 25th AIAA Aerodynamic Measurement Technology and Ground Testing Conference. 25th AIAA Aerodynamic Measurement Technology and Ground Testing Conference, San Francisco, California, (2006-2955-1-2006-2955-12). 5-8 June 2006. Smart, M K and Tetlow, M R (2006). Orbital delivery of small payloads using hypersonic airbreathing propulsion. In: 14th AIAA/AHI Space Plans and Hypersonic and Technologies Conference. 14th AIAA/AHI Space Plans and Hypersonic and Technologies Conference, Canberra, Australia, (1-17). 6-9 November 2006. Hass, Neal E., Smart, Michael K. and Paull, Allan (2005). Flight Data Analysis of HyShot 2. In: Proceedings of the 13th AIAA/CIRA International Space Planes and Hypersonic Systems Technologies Conference. 13th AIAA/CIRA International Space Planes and Hypersonic Systems Technologies Conference, Capua, Italy, (2005-3354-1-2005-3354-17). 16-20 May 2005. Star, Jason B., Edwards, Jack R. Jr., Smart, Michael K. and Baurle, Robert A. (2005). Numerical Simulation of Transient Scramjet Combustion in a Shock Tunnel. In: Proceedings of the 43rd AIAA Aerospace Sciences Meeting and Exhibit. 43rd AIAA Aerospace Sciences Meeting and Exhibit, Reno, Nevada, (2005-428-1-2005-428-18). 10-13 January 2005. Trexler, C. A. and Smart, M. K. (2003). X-43C Inlet Development and Testing. In: Proceedings of the 2003 Joint Army-Navy-NASA-Air Force (JANNAF) Meeting. 2003 Joint Army-Navy-NASA-Air Force (JANNAF) Meeting, Antlers Adam’s Mark Hotel; The Aerospace Corporation, Colorado Springs, CO, (). 1-5 December 2003. Smart, Michael K. and White, Jeffery A. (2002). Computational Investigation of the Performance and Back-Pressure Limits of a Hypersonic Inlet. In: Proceedings of the 40th AIAA Aerospace Sciences Meeting and Exhibit. 40th AIAA Aerospace Sciences Meeting and Exhibit, Reno, Nevada, U.S.A., (2002-0508-1-2002-0508-20). 14-17 January 2002. Capriotti, D. P., White, J. A., Smart, M. K., Gallimore, S. D., Ferleman, P. G., Cutler, A. D. and Messitt, D. G. (2002). Experimental and analytical performance characterization of the aerojet cascade fuel injector. In: Joint Army-Navy-NASA-Air Force (JANNAF) Meeting, Destin, Florida, (). 8-12 April 2002. Smart, Michael (1988). Analysis of a scramjet nozzle exhaust : an analytical study of the flow field in the nozzle exhaust of a vertical strut injected scramjet for the purposes of thrust calculation Master's Thesis, School of Engineering, The University of Queensland. Investigations in HyShot Flight Test #3 and #4. Design of a variable Mach number scramjet flowpath for access to space.